Looks like this blame thing is going around. All kinds of mistakes are surfacing as the politicos attempt to shift the problem to a person and not their concept or system that is not performing as they would like. Could anyone have made this turkey fly? This is being hailed as the “biggest job creator in the Central Valley”. And here we thought it was supposed to replace the need for air traffic between SF and LA. If the intention is to create jobs, the High Speed Rail must be a big success. Maybe the better use of taxpayer funds would be to move the businesses to the Central Valley where the workers need jobs and housing is not a problem. Moving jobs where they are needed solves three problems: Jobs, housing and transportation and the corporations can pay for construction of the new offices and building, saving the taxpayer billions in expenses. Amazon Is Coming. Can New York’s Transit System Handle It? When Andy Byford, the New York City subway leader, met with Amazon executives during the summer, Mr. Byford boasted that Long Island City in Queens was a transit wonderland ready to serve their army of workers. In the Bay Area, we’re witnessing one transportation infrastructure setback after another. Too many projects are late, over budget and provide limited benefits, leaving travelers stuck in traffic. Local leaders should consider policies to make infrastructure projects less costly and more reliable. Shifting risk onto the private sector and using more standard technologies are two such policies. 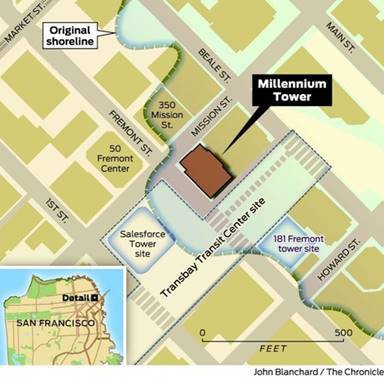 The latest setback is the closure of the $2.2 billion Salesforce Transit Center due to construction defects. Besides a rooftop park and an unused high-speed rail terminal, the elaborate structure includes overpasses spanning Fremont and First streets. Whatever technology officials choose for intercity rail and other transportation projects, they should award projects on a Build Operate Transfer (BOT) basis. Under BOT, a private contractor has responsibility to complete the project and establish service for a predetermined cost, eventually turning it over to the government. The contractor gets the opportunity to make extra profits, but the company takes on the risk of losses when construction costs exceeds budget or revenue service is delayed. While for many Bay Area progressives, public-private partnerships may be a dirty word, the fact is that all our major infrastructure projects involve private contractors. The operative question is not whether companies have a role, but whether they have incentives to get projects done on time and within budget. Supervisor Kim’s Office and the San Francisco Planning Department will be hosting three public meetings to discuss Supervisor Kim’s proposed legislation to remove remaining minimum parking requirements in San Francisco. Details on dates, times, and locations are listed at the bottom of this page. Read the background information at the above link. Please RSVP by emailing Kimstaff@sfgov.org with the date you will be attending. Hello Everyone: More information gained from engineering magazines and photographs (structural drawings not public). Over Fremont and First Streets, the lower bus deck is essentially a suspended bridge—hung from two 8-foor deep girders at the upper park level. Somewhat unusual for a suspension structure is the single chord (vertical column) that hangs the lower bus deck from each girder. The Y-shaped tree columns, at the building exterior, are primarily bracing elements that have flexibility. At the bridges, the two upper girders carry most of the load of the park deck and the suspended bus deck. 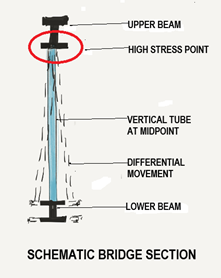 The single chord (vertical column), at the midpoint of each girder, is heavily loaded. Suspended structures do move. And the Y-shaped tree columns allow movement. Ultimately, the lesson here may be that simplicity is best. The bridge design seems overly complex. The simple approach would have been a truss bridge, where the bridge’s entire height (from park level down to bus level) acts as a single “beam” or “tube”. At that midway point, where each girder meets a single column that in turn supports the bus deck below, is where each of the cracks occurred. “Those two girders are working hard, spanning a good length and bearing a heavy load,” Panian said. “And the place where it’s expected to carry the most load is where it is cracked.” What may have helped prevent disaster is that the two girders don’t hold the span in place all by themselves. They’re paralleled by smaller, more conventional beams on either side that connect to the transit center structure on the east and west. Who is focusing on transportation issues when the Metropolitan Transportation Commission is focused on Housing? Might that explain the multiple mistakes being made on large Bay Area regional transportation systems? NOTE THE TITLE OF THE ORGANIZATION AND THE SUBJECT MATTER. Why is the Metropolitan Transportation Commission concerning itself with housing? Who is working on transportation while the Metropolitan Transportation Commission is working on housing? Why don’t they just call themselves the Metropolitan Housing Commission and let another organization deal with transportation only? If this bothers you, take it up with your local government and your state legislators. If the goals of MTC are changing to address the state housing crisis, there should be a public conversation about this.